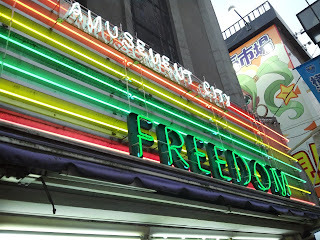 Yesterday, I paid my first visit to Yokohama Freedom. 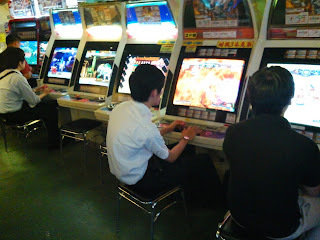 I went on Satou's recommendation, since he said it was a good arcade for Guilty Gear. It's also half the trip Mikado is, so that's a plus. Pretty loud of an entrance for such a small arcade. The first floor is, as it is with most arcades, a lot of UFO catchers and something to do with Hatsune Miku. Yawn. The second floor is nothing but rhythm games and mahjong cabinets. More yawns. Once you make your way up that third staircase, you'll be greeted by a crowd of people watching the closest cabinet. That's how you know it's where the action is. From left to right: two AE2012 cabinets, two 3S cabinets, a CVS2 cabinet, and two +R cabinets. The top floor is every bit as small as the two floors below it, but it manages to cram a lot of games in such a tight space. Aside from the cabinets pictured above, there's also a full 8 player EXVS setup (as well as a Gundam Terminal), and two head to heads that rotate out different games on each day of the week. Yesterday, those cabs had Garou: MOTW and MBAACC. Today, they had Marvel 2 and SFEX2 (lol). As for the level of play: it really is pretty high, all things considered. On a good night, it's not too much lower than Mikado. Otherwise, it's still higher than most arcades that have +R. Still, I find myself winning a lot more here than I do at Mikado. I guess I still have to make that trip up to Takadanobaba, after all. I play fighting games. Through documenting my own progress as a player, I hope to promote a better understanding of fighting games. I talk about other stuff sometimes, too.